Who is the author of the software available on this web site? What is the experience of the authors of the software? Does this software run on Windows 10? Is this software compatible with older versions of Windows? I don't see the user interface language for my country in the Time Sheet. The user interface translation in the Time Sheet is wrong or incorrect. The Time Sheet doesn't have a feature I need. Can you add it? How do I completely remove the Time Sheet from my computer? How can I buy the Time Sheet program license? How much does it cost to buy license for the Time Sheet program? What if the license selection for the Time Sheet program doesn't suit my needs? How can I move the Time Sheet program to another computer, or to another Windows user account? What if I purchased the license for the desktop version of the Time Sheet app, can I use it for a copy of the app that I downloaded from the Windows Store? How to tell whether I have a desktop or a Windows Store version of the Time Sheet app, and what version number is it? Does the Time Sheet app installer support silent installation? I purchased a license for the Time Sheet app. Is there a way to install and register it on multiple computers at once? I've been using your app for a while, but now when I run it I get an error message that says, "A device attached to the system is not functioning." I forgot my password for the user account in the Time Sheet program. How do I reset it? One of our employees has left the company, but there's still his/her account in the Time Sheet program and we don't know the password. How can we remove it? I paid for my license via PayPal but I did not receive registration email. I paid for my license some time ago. Now I need to reinstall the software but I can't find the registration email. Every software product available for downloading on this website was designed and coded by a trusted team of developers lead by Dennis A. Babkin. 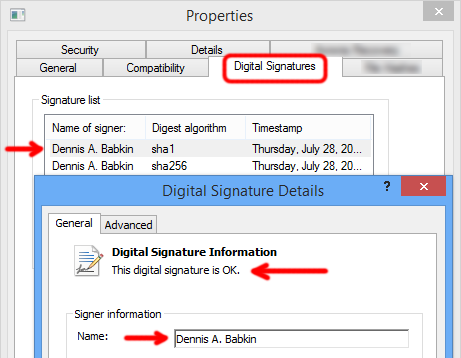 For authenticity and to provide better trust for our users we code-sign our executable files with Dennis' personal digital certificate. Yes, absolutely. It runs as a desktop app, or as a UWP app that you can download directly from the Windows Store. It depends on how far back you want to go. We tested the Time Sheet program to run on Windows Vista, as well as on Windows XP SP3. The development of the Time Sheet is the work in progress. We will be adding new user interface languages as we go. Please contact us via feedback if you want to help us with the translation to your language. We apologize for that. We do not have the in-house capabilities to translate the Time Sheet to any language other than English. So since all translations are done by our loyal supporters and since most certainly we do not speak that language ourselves, it is possible that some translations were made incorrectly. If you want to help us correct it in the next update for the Time Sheet, please contact us via feedaback. Yes, absolutely. Make sure to send your suggestions via feedback and we'll do our best to implement them in one of the next updates to the Time Sheet. Also please be assured that we read all your messages, in despite of the fact that we're not always capable of replying to everyone. If you're using the Time Sheet version 1.3. * or later, simply go to the Windows Control Panel, pick "Programs and Features", locate "Time Sheet - Small Office Tools" in the list and click Uninstall to remove it from your system. For Windows 10, go to Start and begin typing Time Sheet. This should bring up the Time Sheet app icon. Right-click it and select Uninstall. If you have a Windows Store version of the app, it will uninstall it right away. But if you have a desktop version of the app, it will open up "Programs and Fearures" window that will let you remove Time Sheet manually. For that locate "Time Sheet - Small Office Tools" in the list, then click it and select Uninstall to remove it from your system. WARNING: If you uninstall the Time Sheet program, it will also remove all of the time sheets and other data collected by the program during its operation! INFORMATION: Uninstalling the Time Sheet program does not remove any data backups made by the program during its operation. To access those (and possibly delete them as well) check the following folder in Documents: "Small Office Tools - Time Sheet - Backups". Note that this location could've been changed in the Time Sheet program settings. While writing the Time Sheet we attempted to make the process of its installation and uninstallation as easy as possible for an average computer user. If you read the main manual you will see that we ditched the archaic Windows-like installation process in favor of a simple drag-and-drop of the Time Sheet icon. To make it as easy for an average user to remove the program, the process is as simple as well. In most circumstances and for the most modern computers this process is more than enough to remove the Time Sheet. Still, for someone with advanced knowledge of how Microsoft Windows operates there will be a question of how were we able to bypass the standard Windows installation procedure with our drag-and-drop (simplified) technique? Well, technically speaking we didn't bypass anything. We simply didn't use it. To delve just a little bit into technical details, the Time Sheet doesn't need to use any of the Windows system kernel, nor any of the Windows protected locations, and thus we didn't need to invoke the UAC, elevate privileges, or do what most Windows programs do during installation. Instead we were able to install the Time Sheet into its own sandbox. Having done that, it can run on any Windows user account with pretty much any user privileges without imposing any threat to the system kernel. But, what about its data file, the Time Sheet must be storing it somewhere? Yes, it stores most of its data in a single SQLite database file. Notice the word "lite". This file turns out to be quite small, say, in comparison to a single indexing file that Windows 7 may create automatically in your pictures folder. Thus for any modern computer removing this database file will make as much of an impact as a single drop in a bucket. Besides that, preserving the Time Sheet's database will ensure that if you change your mind in the future, all of your data will remain intact. OK, but what about the System Registry, the Time Sheet must use it as well? Yes, it does use it, but again, the only thing it uses it for is to store a handful of user preferences that has a very miniscule impact on the overall size of the used space on your hard drive. Still, if you want to remove all of the data mentioned above, download this utility that will do it for you. And lastly, let me assure you what the Time Sheet does not do: It does not modify or in any way access any of the system (or private) parts of your system and of its kernel. It does not install anything on your computer (except its database file that it keeps in the application data folder for the current Windows user account). It does not write itself into the Windows auto-start. It does not add or modify anything in your web browser. After you've downloaded and installed the Time Sheet program, click "Buy Your Copy" button in its main window. Or, go to "Help" in the main menu on top and select "Buy Your Copy". If you downloaded the Time Sheet app from the Windows Store, the app will display the store purchase window. After you complete the purchase your copy of the Time Sheet will be activated immediately. If you downloaded the desktop version of Time Sheet, the app will take you to our web site that will process your payment. After your payment is processed you will receive an automatic email with the instructions on how to register your copy. (This email will be dispatched to your email address associated with your PayPal account.) Note that if you did not receive the registration email within a short time after making a payment, check your Spam folder. For security concerns we will not be able to resend your registration email to an address other than the one associated with your PayPal account. Once you make a one-time payment for the license that suits your needs, you will own that license for the life-time of your version of the Time Sheet app. Check this FAQ for details on how to buy license, or this FAQ on how to move license from one computer to another. Note that this license scheme does not apply if you purchase your copy of the Time Sheet app from the Windows Store. Check Windows Store for details. In most cases you should select the license type that encompasses the number of copies of the Time Sheet app that you will be using. For instance, if you need only a single copy of the app you should select the license for 1-10 copies. Similarly if you need 11 copies of the app, you should select the license for 11-20 copies. Alternatively, if you don't know the actual number of copies that you may need, you should select the "unlimited" license. Note that if you downloaded your copy of the Time Sheet app from the Windows Store, your license agreement will be different. Check Windows Store for details. For additional questions, contact us via feedback. From within the program, go to Help -> About. Click on the "De-authorize" button and confirm by clicking "Yes." Note that if you purchased your copy of the Time Sheet app from the Windows Store, you will be bound by their terms of the license agreement. No. Those license types are not compatible and should not be mixed. Moreover, we will not be able to transfer one license type to another. If you're planning to run the Time Sheet app primarily on Windows 10 as a user who logs in under the same Microsoft account, we recommend that you purchase your license from the Windows Store. For any additional license types available through Windows Store you should contact Microsoft directly. Otherwise, for more complex license schemes please download and use the desktop version of the app. If you haven't downloaded the Time Sheet app yet, your can download a desktop version from here, and the Windows Store version from here. Note that both versions work in a very similar way, and one does not have a significant advantage over another. The only difference is in licensing schemes, and in the way each version is installed, uninstalled and updated. Desktop version assumes manual installation, while Windows Store version does so automatically. Windows Store version can also be installed only on Windows 10 or later OS. Note that you must use the same .msi installer file that was used to install the desktop version of the Time Sheet app. Before running this command, ensure that all copies of the Time Sheet app are closed. This command cannot be used to uninstall the Windows Store version of the app. <name> Registration name that was emailed to you after you purchased the Time Sheet license. <code> Registration code that was emailed to you after you purchased the Time Sheet license. <features> Comma-separated list of features to install. See this FAQ for details. Will install the Time Sheet app along with its Start menu and desktop shortcuts, and also register it under the name of John Doe. Note that the registration code given in the example above is not a valid one and is used for demonstration purpose only. INFORMATION: Windows Store version of the Time Sheet app does not support this feature. Cause: This seems to be a bug in Windows 10. The reason you see this message is because your trial period for the Windows Store copy of the app has expired. Unfortunately Windows 10 doesn't seem to handle such condition with any grace. We hope that Microsoft will soon fix this issue. Resolution: Click this link to bring up Time Sheet app in Windows Store. Click "Buy" to purchase it. When your purchase goes through, try running the Time Sheet app again. If the error message persists, reboot your computer and try again. If rebooting doesn't help, uninstall the Time Sheet app and then install it back. (You will not have to purchase it twice.) This will fix the issue, although if you uninstall the app, it will also permanently delete all the data in it, including users in the app and their time sheet records. Note that we have no control over how Microsoft handles Windows Store app uninstallations. So make sure to enable automatic backups while using the Time Sheet app. In that case you will be able to restore from the last backup that is placed in the following folder within Documents: "Small Office Tools - Time Sheet - Backups". Note that this location could've been changed in the Time Sheet program settings. If there's at least one administrator account: request any administrator to reset your password. To do that an administrator needs to log in to the Time Sheet program, then switch to your account using the drop-down control at the top of the Time Sheet window, then go to Employees -> Edit Employee in the main menu, and provide a new password. After that you can log in using that new password, which you can then reset to your own password using the same steps. If there's no administrator accounts: go to Employees -> Force Employee Removal in the main menu, then pick your account from the drop-down list and click "Schedule Removal" button. After that you will be able to remove your account after the waiting period of 30 days has expired. When your account is removed you will be able to start a new account under the same name. Alternatively, if you don't want to lose your time sheet records by removing an old account, you can start a new account by slightly modifying your name. If there's another administrator account, request them to create a new account for you by slightly modifying your name. Alternatively, you can do a force removal of your old account. For that go to Employees -> Force Employee Removal in the main menu, then pick your account from the drop-down list and click "Schedule Removal" button. After that you will be able to remove your account after the waiting period of 90 days has expired. Note that when a user account is removed, the process also deletes all time sheet records for that user. NOTE that due to design of the Time Sheet program database, our support team or developers will not be able to recover your lost or forgotten passwords, or in any way facilitate with logins to your inaccessible accounts. The easiest way is to request a user with administrative privileges to delete that account. To do that an administrator needs to log in to the Time Sheet program, then switch to the account that you want to remove using the drop-down control at the top of the Time Sheet window, then go to Employees -> Remove Employee in the main menu, and follow on-screen instructions to remove that account. Alternatively, if there is no administrator account set up yet, or if the account being removed is an administrator, you can request a force removal of that account. For that go to Employees -> Force Employee Removal in the main menu, then pick the account from the drop-down list and click "Schedule Removal" button. After that you will be able to remove that account after the waiting period of 30 days (for employees) and 90 days for administrators has expired. Note that when a user account is removed, the process also deletes all time sheet records for that user. All registration emails are sent automatically to the primary email address associated with your PayPal account. In some cases your email provider (GMail, Outlook, etc.) may place your registration email in the Spam, Junk, or Other folder instead of your Inbox. So the first step is to check in those folders. But if you still can't find the registration email, contact us and provide your registration name or an email address associated with your PayPal account and we will re-send you a copy of your registration. IMPORTANT: It is paramount to note that if our original email did not reach you, sending us your follow-up email from the same address will probably result in our second email not reaching you either. So keep this in mind! As a guaranteed two-way communication channel, please consider Direct Messaging us @dennisbabkin on Twitter. IMPORTANT: Additionally, to prevent scam, please note that we will not forward your registration information to an email address other than the one associated with your PayPal account. If you can't find your previous registration email, contact us and provide your registration name or the email address associated with your PayPal account and we will re-send you the registration. To find your registration name bring up the Time Sheet software and then go to Help -> About in the top menu. The popup window will show the registration name for that copy. Also, as a side note, please make sure to read this FAQ on how to de-authorize your old copy. IMPORTANT: After you email us your request, make sure to check your Spam, Junk or Other folder. At times your email provider may place our reply there. As a guaranteed two-way communication channel, please consider Direct Messaging us @dennisbabkin on Twitter. IMPORTANT: Additionally, to prevent scam, please note that we will not forward your registration information to an email address other than the one associated with your PayPal account that was used to purchase your license.